Part of me really wants to hate this film. Another part of me adores this film. I feel like love is winning over hate. If you know much about Martin Scorsese or have seen his work, then you know that he really enjoys gangsters and that he attempts to make them look like normal guys who chose this lifestyle, instead of other filmmakers who make them out to be bad guys. His work in films like “Goodfellas” and “The Departed” are a good example of that. Now that we’re in the 21st century, the depiction of gangsters has changed drastically, much to Scorsese’s irritation, I’m sure. The humble and soft-spoken days of Don Corleone and Tony Soprano are long gone. The gangsters of old are no more. Yet it seems like Martin Scorsese has found a way to keep telling those stories, but though a new type of gangster: The stockbrokers. 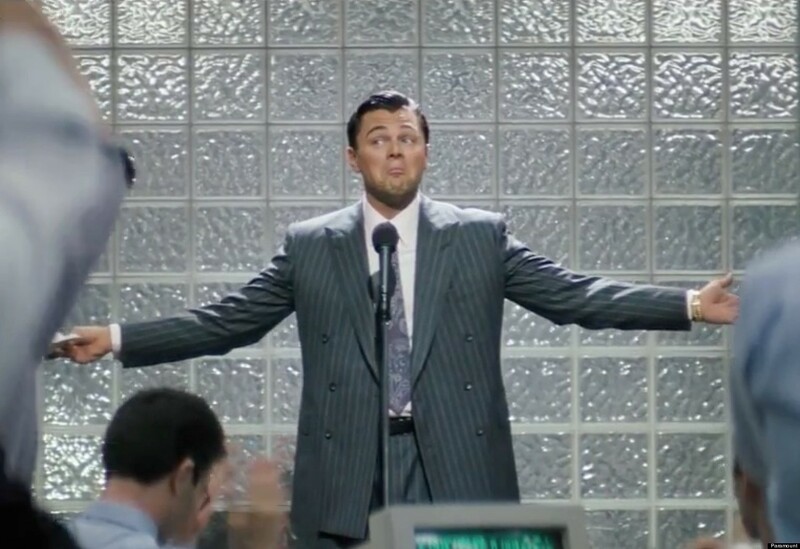 Jordan Belfort (Leonardo DiCaprio) owns the largest estate in New Jersey, a yacht that is so huge that it can store a helicopter, the fastest sports car imaginable, can afford $25,000 dinners on a whim, has a wife that has been dubbed “The Duchess of Bay Ridge” yet constantly cheats on her with million dollar hookers and still has enough time to take drugs at nearly every interval in the day. All of this because of his illegal business in the stock market. 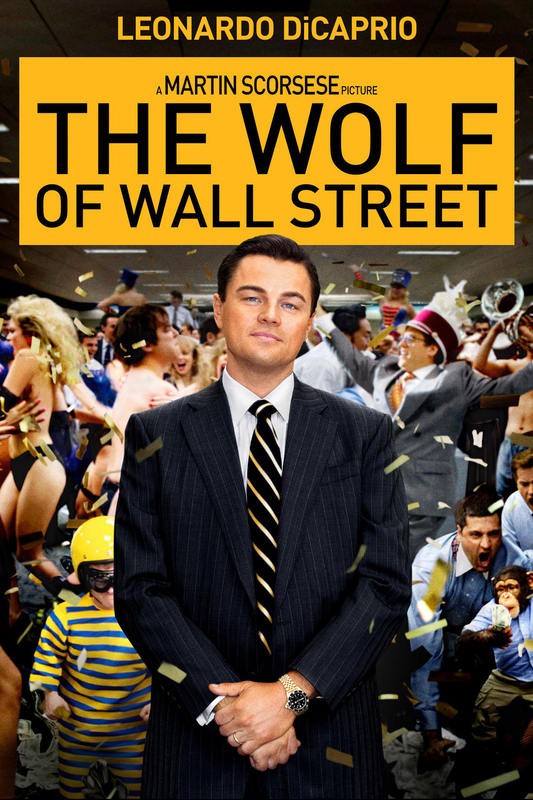 The film follows Belfort from his humble beginnings as a call-taker on Wall Street, to his power hungry and money-obsessed moments of success, to the FBI hunting him down and his attempts to evade them at every turn and continuing to live his exuberant lifestyle. If you’ve seen “Goodfellas” then you can probably guess why I want to hate the film. Because this is the same movie, even down to the dramatic narration that takes specific care to mention why their lifestyles are so fun and addicting and speaking directly to the audience. Heck, Dicaprio even has a nearly identical voice to Ray Liotta. Yet, for that very same reason, I kind of enjoy the film. Since when was it a bad thing to feel and act like one of the best gangster movies of all time? This film takes the time show us why Belfort would choose this way of life and why it can be so rewarding. Not just the money, because he’s willing to throw that away like garbage, but because of the power. He feels like he could do anything he wanted and get away with it, even bribing a federal officer to get him off his back. Like “Goodfellas,” the characters of this film believe that they are in their own little world. That those who live in the “normal world” like us are sad and pathetic losers who are essentially waiting for handouts instead of doing it ourselves. They’re so caught up in what they’re doing that they can’t see anything other than their own ego. This makes them the best kind of douchebags imaginable. The kind that are so self-absorbed that they are fun to watch and keep you guessing on how events will unfold. They’re not relatable or sympathetic, but they’re not supposed to be. They just want as much power as they can get, which is admirable. At the same time, you still want to see them get their comeupins. So it’s the best of both worlds. The people in “The Wolf Of Wall Street” are scumbags who rip off those less fortunate than them and don’t care about anyone other than themselves. I wouldn’t have it any other way.